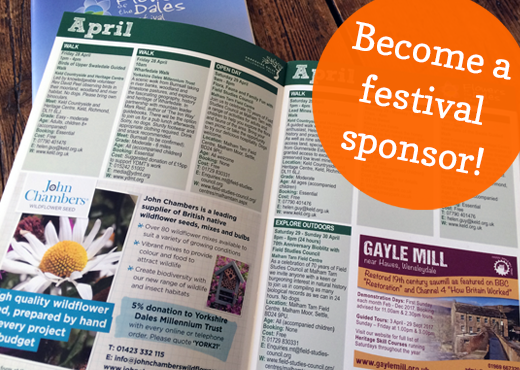 Become a Flowers of the Dales Festival sponsor or adverise your business in the Festival booklet and make a real difference to YDMT’s work to care for the people, landscape and wildlife of the Yorkshire Dales. More than 6000 people attended events last year. A unique way to show your customers and staff that you care about the local landscape. Now in its 11th year the Flowers of the Dales Festival provides a wide range of more than 100 exciting and fun events and activities run by Yorkshire Dales Millennium Trust and partner organisations each year. The Festival celebrates the fantastic wildflowers and natural habitats of the Yorkshire Dales, giving local residents and visitors the opportunity to learn about their importance. If you're planning your own wildflower or nature themed event for 2019 why not promote it for free in the Flowers of the Dales Festival programme? Please contact us on 015242 51002 or email info@ydmt.org for more information. Sponsor Flowers of the Dales Festival 2019! Four free tickets to our guided Meadow Walk in June. You can also advertise your business in the Festival booklet from £150. For more information or to make a booking please contact 015242 51002 or email info@ydmt.org. Please make your booking by no later than Monday 14 January 2019.